Why reinvent the wheel when nature has the answer? That's what researcher Michael Janech, Ph.D. of the Medical University of South Carolina, has found to be true, drawing from the field of biomimicry where researchers look to nature for creative solutions to human problems. In Janech's case, his natural inspiration is coming from dolphins who seem to have protective proteins that may contain clues to treatments for aging-associated diseases in humans. A recent study published in Nature's Scientific Reports September 26 issue found dolphin serum contains very high levels of an antioxidant protein. Janech, director of MUSC's Nephrology Proteomics Laboratory, said he was surprised by the finding and excited about how this might be used in future studies to help humans. Dolphins survive dives that deprive vital organs of oxygen without causing damage and that for humans would be lethal. During dives that can last as long as 90 minutes, marine mammals restrict blood flow to their kidneys, liver, heart and lungs to shunt more oxygen to the brain. When marine mammals resurface, oxygenated blood flow is restored to those organs without the organs suffering damage. In humans, though, the same phenomenon of hypoxia or being deprived of oxygen followed by re-oxygenation, such as experienced during heart attack, stroke and acute kidney injury, causes the release of free radicals thought to damage human organs. Janech, a kidney researcher and expert in proteomics, was curious what gives dolphins this advantage. Proteomics is the study of all proteins that are encoded by the genes, he said. "We attempt to analyze all the proteins at once rather than individual proteins at one time in a cell or a tissue or an organism. It's just like genomics – when people are looking at 20,000 genes and seeing if they are high or low in certain disease states. We're doing the same thing with certain proteins." "There are more than 100,000 protein variants, but each protein can be modified. We have more than a million different protein variants based on modifications." 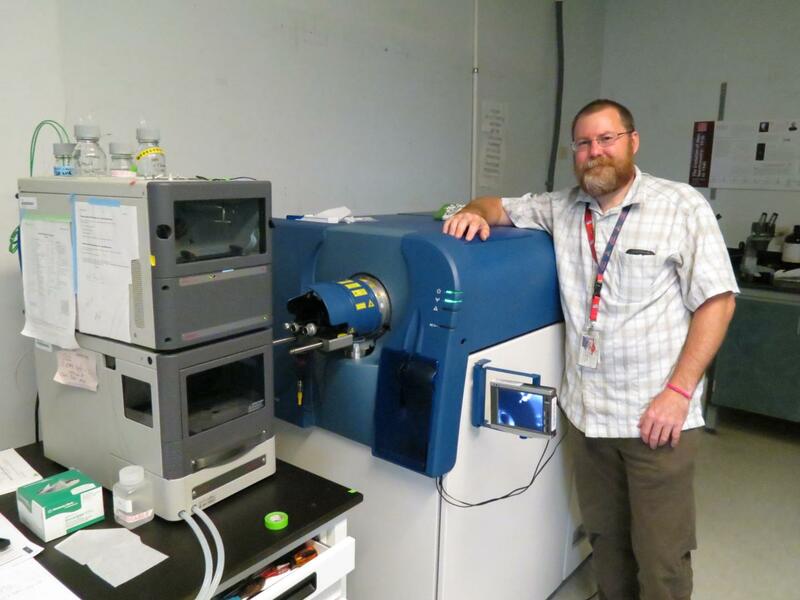 Because the diversity of proteins is so large, researchers usually require mass spectrometers that perform at high resolution, allowing investigators to accurately determine the identity of proteins and other molecules of interest. This expertise came in handy in how the current study came about. While Janech was working with the Marine Mammal Center in Sausalito, California, and the National Marine Mammal Foundation in San Diego, California, to identify biomarkers in sea lions affected by toxic algae blooms on the west coast, he learned that some of the managed dolphins in the U.S. Navy Marine Mammal program were living much longer than wild ones. They were developing insulin resistance and fatty liver disease as they aged, a process consistent with the development of metabolic syndrome in people. This observation presented a rare opportunity. "That's not a model that anybody sees in nature, because dolphins usually don't get this old in nature," said Janech. Janech joined forces with Stephanie Venn-Watson, director of the National Marine Mammal Foundation's Translational Medicine Research Program in San Diego, and Randall Wells, director of the Chicago Zoological Society's Sarasota Dolphin Research Program in Florida. Venn-Watson is a veterinary expert of the Navy's managed dolphin populations, while Wells is an internationally respected expert of wild dolphin biology. Together the group is attempting to determine the cause for insulin resistance in managed dolphins, and then use knowledge of human and dolphin similarities to find clues for treating the condition in both species. With funding provided by the Office of Naval Research, the Janech laboratory began to track adiponectin in the serum of the managed and wild bottlenose dolphin populations. Levels of adiponectin, an insulin-sensitizing hormone, were predicted to be different in managed dolphins with metabolic syndrome in comparison with those in the wild. In order to verify the relevance of their work to human metabolic syndrome, they also performed simple proteomic analyses in human and dolphin serum samples. Given that the major proteins in mammals are constant across species, they expected the highest concentration of proteins to be similar in both species. What they found when they looked just below the threshold, however, was surprising, he said. Eleven proteins were at least 100-fold more prevalent in dolphin serum than in humans. At first, the group wrote this off as a difference in genetic ancestry: at some phylogenetic branch in the evolutionary tree of development, some mammals branched off and developed into two-toed ungulates and some went on to become primates. Bottlenose dolphins are mammals descended from even-toed ungulates such as pigs, deer, and giraffes. To check that this was the case, they also mapped the serum proteome of the pig, and were again surprised. The 100-fold rank differences in 5 of the proteins, including vanin-1 and adiponectin, could not be explained away by simple phylogenetic differences. While adiponectin is known to be higher in dolphins, as a way to control glucose storage during feeding, very high vanin-1 was a novel finding. Interestingly, excessively high vanin-1 levels were correlated with decreased liver function in the wild dolphins, which suggests they provide a protective effect in avoiding metabolic syndrome. But Janech, Venn-Watson, and Wells also noticed another potential need for vanin-1. The function of vanin-1 is to make vitamin B5 and in doing so it releases an antioxidant that has been shown to protect tissues from injury like that which occurs after the hypoxia and re-oxygenation of diving and resurfacing. The question is if this could work also to help humans resist the hypoxia that causes acute kidney injury, which Janech has applied for a grant to the National Science Foundation to study. He and colleagues are gathering samples from a number of different diving and non-diving marine mammals, and land-bound mammals, and mapping their proteomes as well. They have continued their current collaboration, and also included graduate students from the College of Charleston's Grice Marine Laboratory and investigators from the National Institutes of Standards and Technology at Hollings Marine Laboratory to help with their measurements. Janech said there's much to learn from the field of biomimicry, especially paired with proteomics. "Proteins are the workhorses of the genes. It is how the gene provides function to the cell. The action of the cell happens through the proteins. That's why we want to study the proteins. These are your enzymes," he said. "This is the first step. We wanted to ask what's different in an animal that can do something that would hurt a human, and they do this every single day. And can we take it back to human medicine?"